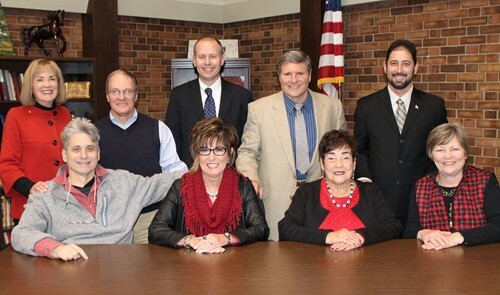 The Bethel Park Board of School Directors consists of nine (9) individuals who are elected at large by the citizens of Bethel Park. School Board members are both state and local officials. Though elected locally, they serve on behalf of the Pennsylvania state legislature. Each director serves without compensation for a term of four (4) years. If you are a Bethel Park Homeowner who has not completed a Homestead/Farmstead application, we encourage you to do so. If you have previously completed an application, you do not need to so again. Homeowners who completed their application will see a $166.09 reduction on their 2018-2019 school property tax bill. If you haven't filled out an application, it is too late to receive the reduction for this school year, but if you fill out a form, you will be eligible for a Homestead/Farmstead Exemption next year. To learn more and to download an application, please click here. BPTV videotapes the Regular Meetings and airs them on Comcast Channel 17 and Verizon Channel 31 six days a week. Please click here for a list of air times and scheduling. BPTV also posts videos of the meeting videos on You Tube. Please click here for the You Tube Channel. The Bethel Park Board of School Directors will allow public comments at its monthly Committee Meetings. Comments at the beginning of Committee and Regular Meetings will be accepted on agenda items only, and there will be an opportunity to address the Board at the end of the meeting on non-agenda items. Speakers will have two minutes to address the Board and must preface their comments with their name and address. Topics for remarks at any School Board Meeting should be directed toward school operations or school programs. Complaints about school personnel or comments that may implicate a potential disciplinary response will not be discussed at public sessions. Non-residents who wish to address the Board can do so by submitting a request form prior to the meeting, which can be obtained at the District’s Administration Building. Please click here to see the Board policy associated with Public Participation in Board Meetings. You can now contact the Bethel Park Board of School Directors via email. Click on School Board Members and you will find all of the contact information for the Board. The Board requests that all correspondence, whether by email or traditional mail, include the sender’s name, address and phone number. 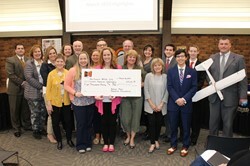 The Bethel Park Education Foundation visited during the March 26 School Board Meeting with some exciting news! The Bethel Park Board of School Directors thanked the Bethel Park Baseball Boosters for their generous donation! 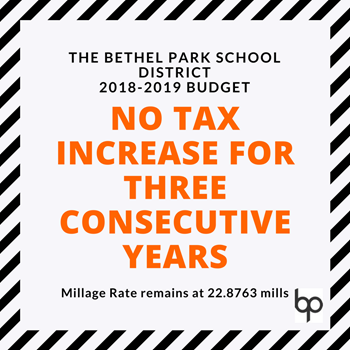 The Bethel Park Board of School Directors passed the 2018-2019 school year budget at its May 22, 2018 Regular Meeting, with no millage increase for the third consecutive year. Please click here to learn more about the conditions under which the Bethel Park School District will file an appeal on residential property assessments. Please click here to learn more about how schools in Pennsylvania are funded. The Bethel Park Board of School Directors passed a resolution calling for the reform of the Commonwealth's Charter and Cyber Charter School Funding. All meetings will be held in the Community Room of the Administration Building (301 Church Road) unless indicated otherwise. The public is invited to attend all of these meetings. You can email the entire Board at schoolboard@bphawks.org. Please include your name, address and contact information.